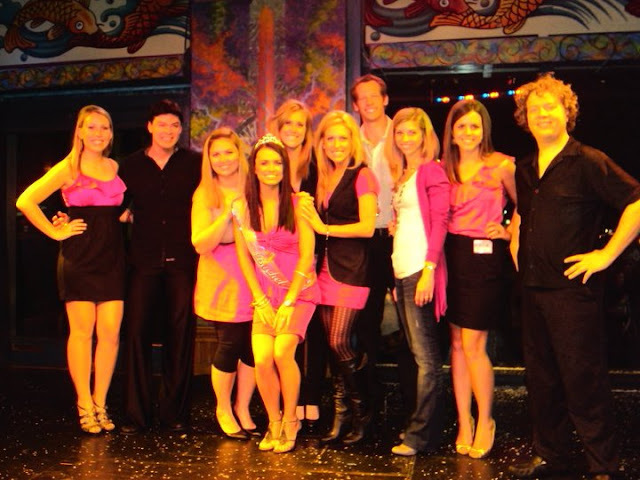 The Chronicles of Ruthie Hart: My Bachelorette Party! So I thought I was done with wedding related posts but how could I forgot my bachelorette party?! If you recall, I was married on February 5th, 2011 and even in Texas, it was cold. My bachelorette party was the weekend before our wedding, January 29th, and it was perfect. When my sisters and bridesmaids asked me what I wanted to do, I said I just wanted to have everyone together. I had no desire to get sloshed on the infamous 6th street in the freezing cold weather and I actually wanted to remember my night! It felt like a night in college, all up in my sisters room in front of the mirror primping and getting ready. My beautiful "big" Ashley (who is famous in our sorority for her hair do skills) outfitted the group with "bumps" and glam eye shadow. Other gifts included an adorable cover up dress, a monogram necklace, scrapbook stuff, and an underwater Flip camera case! We headed to a nice area of North Austin called The Domain. It is an outdoor shopping area with restaurants and nice condos. We had yummy cocktails and dinner at NoRth which is modern Italian cuisine. They also have locations in Arizona, Colorado and Kansas. Yes that is a baby in the pic!! If you can believe it, Mary Amanda had given birth weeks before my bachelorette party and still managed to hang with us! Logan wore a onesie that said "I HART RUTHIE". How cute is that. 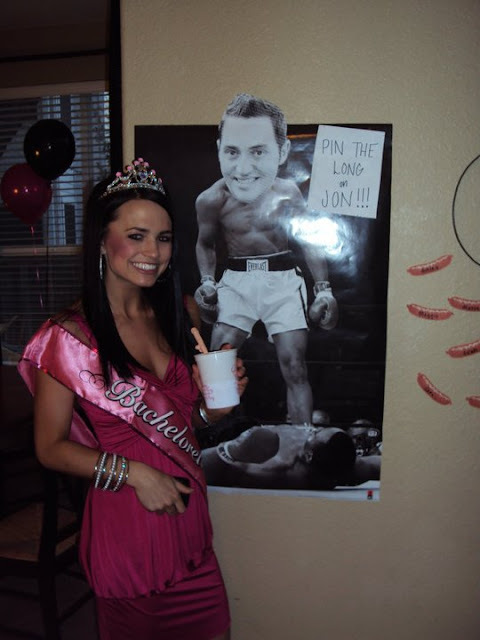 Oh and her husband was hosting Jon's bachelor party that same day at his family's farmhouse outside of Austin. Who says the fun ends after you have a baby?! We headed downtown to a premier comedy show called Ester's Follies. It is hysterical! It was my first time attending and it was so much fun. It consists of magic, music and parodies of current events. I had walked by the window many a times on 6th street and am glad I finally went! It is definitely a classic Austin to-do! Now how did these 7 ladies end the night? We headed back to the house and ended up staying awake until after 4am. Laughing. Drinking. Chatting. Eating Whataburger. It was exactly what I wanted for the night. Great conversation with my best friends. It was the perfect way to spend my last weekend as a single lady. The next morning, with just a few hours of sleep, we had a great breakfast at Waterloo Ice House. I remember thinking that Sunday "OMG. Next Saturday I will be married. No more Saturday nights as Ruthie Fanning!". It was such an exciting feeling! Question: if you are married, what did you do for your bachelorette party? Or what is your favorite memory from attending a bachelorette party? You all look so CUTE in pink! Comedy shows are the best!! Love the pics!! looks like it was a great time! aren't bachelorette parties the best!? so fun! Y'all looked great! I'm glad you had fun! what a fun bachelorette party! i love hearing girl's maiden names too for some reason. and you are adorable in all your photos by the way! Sorry that my version of pink was a sweater and not a hot little dress. Story of my life. Looks fun! We had a cowgirl theme for my bachelorette party...everyone wore denim skirts, plaid, and straw hats! Love all the pictures! You guys are gorgeous! I also really like your dress. Sounds like a fun night!! & I love all of your pink! For my Bachelorette Party, we stayed on the Riverwalk in San Antonio & had dinner. Saturday morning we work up and headed to New Braunfels. We floated the river all day. It was a blast & I am working on finishing my wedding post. Bachelorette party is on the list! That looks like so much fun. I like how ya'll all match. We went to 6th street for my best friends bachelorette party. I loved it. Like Bourbon Street but cleaner. We wore pink wigs and black dresses. BTW I gave you a blog award over on my page before I left for vacation but never had a chance to let you know! OOH! And we bring Bentley home on TUESDAY!! awww ruthie. this looks like so much fun. you definitely have some wonderful women in your life. and i love that embroidered tote bag! LOL oh my gosh, Steve I practically had that exact experience for our date night the other night! I posted about it recently on my blog. Haha. We went to dinner at NoRTH (I LOVE that place!) and then to Esther's Follies. ;) It was my first time at both - super fun! I think we're going back to NoRTH on Labor Day. I got a coupon sent to me for 25% off! Yes! That sounds so fun! So excited to see these event details. Thanks for great share!! 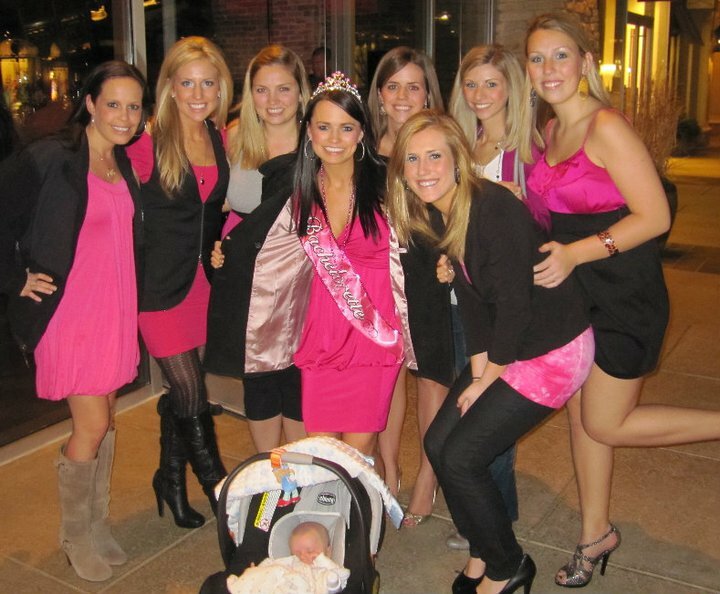 At some local Los Angeles venues I have also been planning to host such fun bachelorette party for my brother. Thanks for these wonderful idea!